Today I have the exciting task of announcing the biggest milestone in the Sentinel Project’s history as an organization so far. Beginning immediately, we are launching a two-year field project in the Tana Delta region of Kenya together with our partners at iHub Research in Nairobi. This work is made possible by the generous financial support of the International Development Research Centre and will focus on researching the origins and influence of misinformation in the Tana Delta and how it relates to interethnic violence in the area. Most importantly, it will inform the development of measures to counter misinformation and reduce the risk of violence. The Tana River is a major landmark in the area bears its name as well as a major dividing line between the Orma and Pokomo communities. As our followers know, earlier this year a Sentinel Project team – of which I was a member – visited the Tana Delta to investigate the series of massacres which killed over 150 people and displaced tens of thousands more between August 2012 and January 2013. Our report on the visit highlighted the apparently significant role of misinformation in driving this violence since members of the Orma and Pokomo ethnic groups hold a range of seemingly false but harmful beliefs about each other. For example, some Pokomo have expressed the belief that the Orma have been provided with large numbers of weapons for the purpose of destroying their community. Orma contacts, for their part, have reported accusations that Pokomo health workers have attempted to poison Orma children. While such reports are unlikely to be true, what matters is that enough people believe them to distrust and fear their neighbours, occasionally leading to violence. The Sentinel Project team sees an opportunity here to have a direct and positive impact on the situation in the Tana Delta by spotting misinformation when it first appears, whether in the form of “organic” rumours or intentional disinformation spread to serve a political goal or other purpose. We will establish a presence in the Tana Delta and set up a mobile phone-based system through which individual citizens can report incidents or potential misinformation as well as receive verification of its accuracy. This will give citizens in the area a stake in the project while also supporting community-based intervention efforts by local leaders and volunteers. 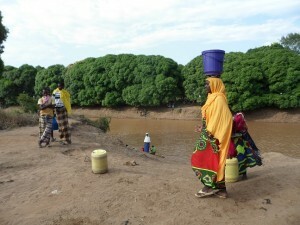 While this project is beginning in the Tana Delta, it has much broader implications since our findings here will support efforts to counter the damaging influence of misinformation elsewhere. At the same time, it will also serve as a testing ground for many of the Sentinel Project’s core concepts. Up to this point, we have very much been in the concept stage as an organization with a lot of great ideas but very little execution, which was a result of having many very talented team members but also very modest resources. Now we can implement our ideas about the importance of acting before low-intensity conflicts turn into mass atrocities, the role of technology in preventing those atrocities, the importance of working at the localized level for early warning and prevention, and the absolute importance of cooperating with communities in harm’s way in order to prevent the violence which could destroy them. Thanks to this great opportunity, we can do more than develop ideas and will actually take the first steps towards saving lives.